Michelle has regrets around her early vintage purchases. Mainly that her 15 year old self didn’t buy it all when it was so much cheaper and able to be found in thrift shops! Her mum’s taste of beautiful things and old movies rubbed off on Michelle and eventually they were commenting on fashion in old film and shopping for vintage together. Then when she moved to New York in the 90’s she found herself in the heart of the swing revival and she was swept up in the movement. Slowly Michelle’s passion grew, she discovered a love of makeup and now runs a blog, teaches vintage makeup classes and is known as the “vintage makeup lady”. These days Michelle and her husband turn heads in New York. When they’re in their best vintage outfits together they even have people yelling out of cars to comment on their look. Michelle says she loves the joy it brings people and the conversations it can start between strangers. As well as looking fabulous, Michelle is a makeup artist specialising in vintage looks. She teaches classes and encourages people to, as well as searching the internet for sources, she wants you to go back to the originals. Books and magazines from the era you’re looking for or have pictures of women at that time and how they used to do their hair and makeup. 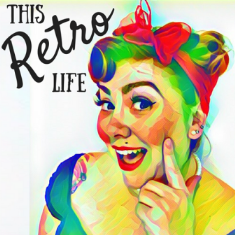 If you want more vintage makeup tips and to hear more of Michelle’s vintage story, make sure you subscribe to our podcast or click here to listen to the latest episode.